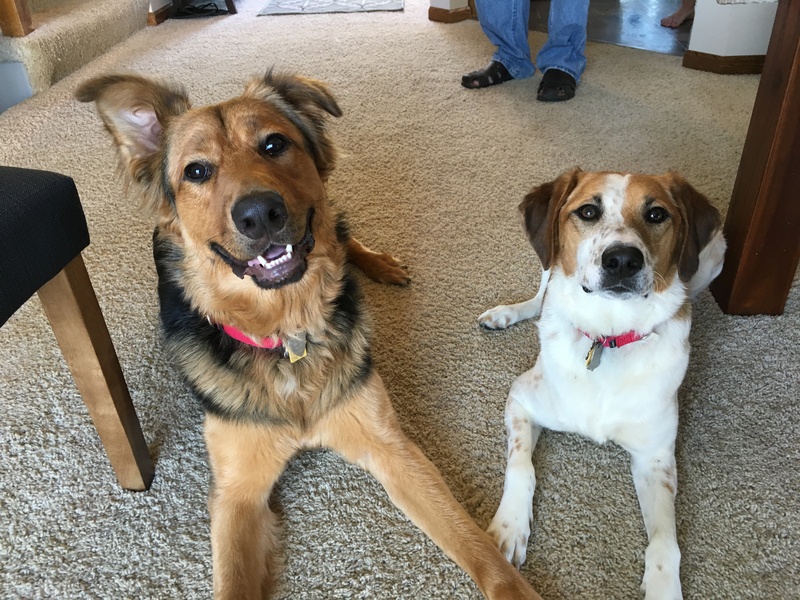 Boss (left) is a one-year-old German Shepherd / Golden Retriever mix who is fearful, has anxiety at times and has shown signs of food aggression. His room mate Lilly (left) is a two-year-old Beagle / Brittany mix who bullies Boss and thinks she runs the show at home. You’ll have to excuse the narration in the following video. I mixed the two dogs up. Lily is the dog that’s attempting to dominate Boss. Aside from the dogs attempts to jump up on me, this was a pretty good greeting. One thing for anyone who’s watching, anytime that you pull a dog away from a door while it is reacting, you can actually increase the dog’s intensity. Later on in the session I showed the guardians how to clean the area around the door before opening it. Skip to the last video in this write up if you want to see how we accomplished that. I sat down with the guardians to discuss the dog’s daily routine and learned that didn’t really have many rules or structure in their lives. When you have multiple dogs living together and you don’t have a very structured environment, it’s pretty easy for the dogs to get the impression that they are peers with the humans. If a dog considers you it’s peer, then listening to you is something that is completely optional. Additionally I noticed that both dogs nudged humans whenever they wanted attention. Each time the humans complied, they were telling the dog they could tell the humans what to do. When you combine these two issues, it is almost the perfect storm for misbehaving dogs. I suggested a number of simple rules for the guardians to incorporate and went over a series of escalating consequences that they can use to disagree with the dogs when they get out of line. It will be important for the guardians to disagree with them with good timing. If you disagree later than three seconds or so, the dog cannot connect your disagreement with the actual action you don’t like. Another great way to create a healthy leader follower dynamic is to teach the dog that it cannot tell a human what to do. Rather it’s only option is to politely ask. In order to achieve this I have developed a technique that I like to call Petting with a purpose. It’s going to take the humans a couple of days to stop instinctively petting the dogs whenever they nudge or paw at them for attention. But once the guardians adopt this new way of interacting with their dogs, they will gradually reinforce the leader follower dynamic they are looking for without thinking every time they pet their dogs. One of Boss’s guardians mentioned that she had real difficulty getting him to pay attention to her when out on walks. She said that he was distracted by everything, even the wind blowing. I spent the next few minutes going over a technique that will condition Boss to look to his guardian on command. This is an exercise I got from my mentor Karen London and she calls it the Watch. It will be important for the guardians to continually practice this exercise in a very quiet environment so that the dog can learn to associate the action with the command word. Once the dog has made that connection, the next step will be for the guardian to gradually increase distractions around the dog while continuing to practice the technique. When rehabilitating dogs, many people mistakenly jump from the first step to last stop. This really puts the dog in a position to fail as it does not give the dog the ability to successfully master the technique. Just like any other skill, practicing it in an easy situation first is key. Eventually they will be able to practice this technique outside while dogs are at a great distance. If their timing is correct and they can give the dog the command word while the other dog is too far away to be considered a threat, they can eventually teach Boss to turn away from approaching dogs and sit down while looking up at his guardian rather than reacting. One other area that I was concerned about was the dog’s reaction to people at the door. While they were not aggressive, clearly jumping up on humans who are guest is not an ideal situation. I spent the next few minutes explaining and demonstrating how the guardians can take control of the door answering ritual. While a lack of rules and structure had given these dogs the wrong impression about their status compared with the humans they lived with, one of the biggest problems was Boss’s unchecked energy. Boss is absolutely a high energy dog and unless his guardians start the draining his energy early in the day on a regular basis, it is going to be difficult for them to truly modify his behavior. I suggested that they incorporate the fetch before any walks to take the edge off. It will be important for them to give boss a 10 to 15 minute recovery period after fetching before heading out on a walk. This should “dial Boss down a bit” and make him easier to manage. I also recommended they get him a halti collar which will give the handler more control. But I think the real solution to this problem is going to be for one of Boss’s guardians to resurrect her rollerblading skills. I have found no better activity that drains a dogs excess energy as effectively as what I like to refer to as dog-skiing. If she can get back her old roller blading skills then throw a harness on Boss and let him pull her until he is exhausted, she’s gonna make a dramatic improvement in his quality-of-life and obedience. By the end of the session, the dogs seem to be more centered and were listening to their guardians commands and corrections much faster. It wasn’t a transformation, but these dogs and their guardians are now on the right path to success. If the guardians can come up with a suitable way for Boss to deplete his excess energy while simultaneously adding rules and structure into the dog’s daily lives, it shouldn’t take long before their nuisance behaviors become a thing of the past.